Andres Bonifacio (November 30, 1863 – May 10, 1897). Political Hero. 1716 – December 25, 1784. Haiku Poet and Painter.
. EIKAN, Priest Eikan of Temple Zenrin-Ji 永観 . Pen-name of tanka poet Kitahara Ryūkichi (北原隆吉). Female Higuchi Natsu (樋口奈津), Higuchi Natsuko (樋口夏子). High Priest of the Tendai Sect. He was close to Tokugawa Ieyasu. First chief priest of the Temple Hongan-ji, Kyoto.
. Keichuu, Keichū 契沖 阿闍梨 Keichu Ajari . October 23. (1741-1789)。Disciple of Buson. Second Son of Kikei. January 14, 1925–November 25, 1970. Author and playwright. St. Nicholas. Nikolaus. December 6. (Seki Osuga) Poet from Fukushima. Haiku poet and disciple of Basho. Haiku Poet of the Hototogisu group. October 2. 1465-1553. 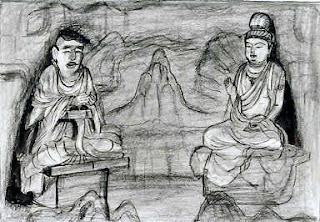 Haikai and renga poet. St Stephen was the first Martyr in Christian history. Founder of the Teitoku Haiku Group. His name was Enni Ben’en 圓爾辯圓 (1201–1280).
. yosamusa ya hyakki yagyoo no emakimono . 17 March 1898 - 30 December 1947) Autor. Friend of Kyoshi. The first Zen Buddhist Master. Check here for the most important days.